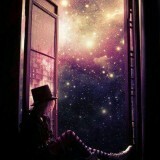 losing myself in the ethereal stars. and stories in the smoke. Sometimes, on the reality shows we see artist draw with their hands; throwing colors randomly on the canvas and it ends on a beautiful painting. To me this poem is quite similar to those paintings. Tone of the poem changes with the stanzas. Rebellious in the first one. Nostalgic in second and third. I have no clue about the others but I enjoyed this pleasant experience written by you, and unlike you I wasn't alone. This poem is so alive that there were moments where I could almost hear your voice reciting the poem for me on the roof of my apartment beneath the heavenly stars and in-between the smoke of the words swinging smoothly from your lips. I involved so much in reading this poem, concerned with beauty, that almost forgot the risk of sitting on the perch - listening to you like one bird to another. I would love to sit beside you anytime, anywhere to see and learn how you form poetry from the stars. How to reach the door to heaven through the rings of the cigarette? So, I can take the snapshot of that picturesque through my eyes and save it my heart forever. If this is what you call scribbling, then you should scribble more. WTS, in a charming way you were with me throughout the poem, and if he is the reason behind these wonderful creations you should visit as soon as possible because we would love to read more of these poems. Oh wow. This made my day. I'm glad you enjoyed it :) thank you so much. I liked this a lot. Your visuals were striking.